New Contracts for DeSean, LeSean Coming Soon? There’s renewed optimism for a DeSean Jackson contract extension, at least according to Jeff McLane. I already speculated on Jackson’s eventual contract here, and the only thing I’d change is probably revise down the total money from $60 million to closer to $50-$55 million over six seasons (given new information about Santonio Holmes’s contract). If the Eagles want to avoid a franchise tag-induced holdout next year, the time is now for an extension. 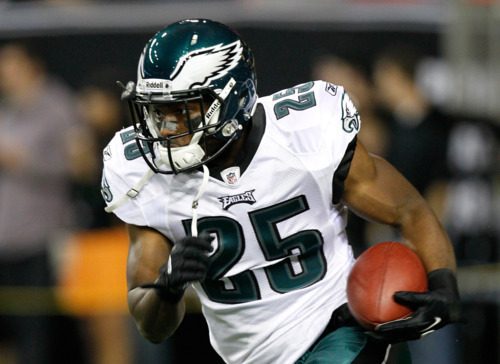 But even if that deal is coming down the pipe soon, another one looms on the horizon for LeSean McCoy. McCoy has proven this year that he’s capable of performing among the best running backs in the NFL and his contract is up after 2012. While the Eagles offense isn’t as dependent on McCoy as it once was on Brian Westbrook, they need to lock him up long term. There are a lot of different situations represented here, but as with the wide receivers, we can at least determine a general ballpark for McCoy’s negotiations. Let’s start at the top. Johnson and Peterson got otherworldly contracts that serve as nothing but the upper bound for McCoy’s talks. There’s no more chance of LeSean seeing $9 million per year or close to $30 million guaranteed than there is of DeSean sniffing Larry Fitzgerald’s $130 million deal. McCoy will probably have trouble even besting the per year contract value of Gore or Williams, since they have more years and more production to bank on. The closest analogue to McCoy in production and age is probably Charles, whose $28 million deal looked like a bargain before he tore his ACL. If McCoy wants to wait this out and get closer to free agency, his play might continue to push his value northward. But, as Charles demonstrated this year, a running back’s career is always in danger. If LeSean can get a reasonable six year, $32 million contract with $14 million guaranteed, he should probably jump on it. Tagged with Philadelphia Eagles, NFL, Contracts, Contract Extension, DeSean Jackson, Jeff McLane, Negotiations, Santonio Holmes, LeSean McCoy, Adrian Peterson, Chris Johnson, Jamaal Charles, Age. October 28, 2011 by Brian Solomon.